In a speech earlier this week, Pope Francis declared evolution and the Big Bang theory to be real. His comments, while not completely unprecedented for the Catholic Church, go against the "pseudo theory" of intelligent design encouraged by his predecessor, Benedict XVI. So, how are creationists responding? Not well. Pope Rails Against Intelligent Design, Says God Isn&apos;t "A Magician"
The emerging theme among commentators is that Pope Francis is denying God's divinity and is "selling out" Christian doctrine to make the Catholic Church seem more in tune with the modern, secular world and attract more adherents. Today, John Ransom, a political writer and finance editor at the popular conservative site, Townhall, published a column with the provocative title, "Can the Pope Shut Up, Too?" In his desperation to be relevant, Francis used words that will hurt Catholics for a long time, unfortunately. 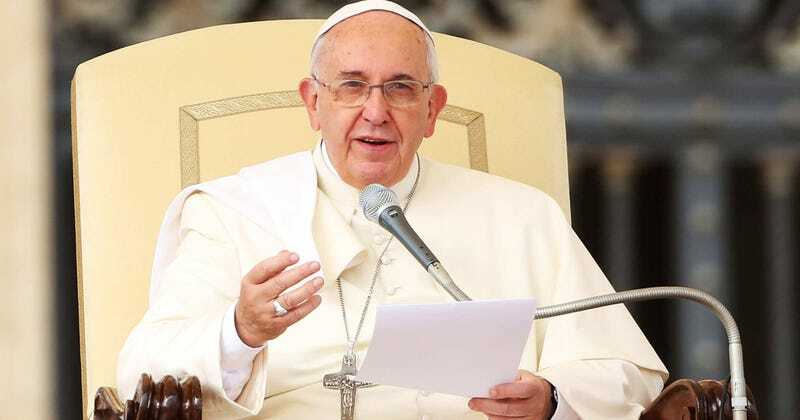 While other media outlets concentrate on Francis saying that God is not a magician, I grieve that a pope would dare to say that God is not divine. I don't know how I can support a pope—or church—that says that God is not divine. The church's role as arbiter of scientific thought seems so important to Francis that he is willing to sacrifice the divinity of our Creator in order to glamorize the secular elements of man. Like similar comments by Francis on the economy and homosexuality, those on the Left will seize upon the Pope's words to demoralize and degrade believers in the Christian Church. They will twist them to work as anti-religious, anti-Catholic propaganda. We have come a long way down from saintly John Paul II to Pope Francis. John Paul II was a miracle of divine intervention who helped spread the faith and convert the nations. But Francis seems to be more concerned with the judgments of men than he is that God. If you wanted to create a religion that almost everyone would love, how would you do it? Perhaps you would change your faith to make it more appealing to a modern world that is changing at blinding speed. Perhaps you would indicate that you are willing to become more "mainstream" on hot button issues such as gay rights. Perhaps you would invite leaders of other religions from all over the planet to come visit you and make it clear that you consider all of those religions to be valid as well. And all of that "unscientific stuff" about God creating the world in six days and creating mankind out of the dust of the Earth? Well, all of that is just going to have to be thrown out. If all of this sounds vaguely familiar to you, that is because this is exactly what Pope Francis has been doing. Ken Ham has written a commentary that addresses the issue by way of a statement that Pope Francis made earlier this month, "God is not afraid of new things." Because God created nature and natural laws, He alone has power over them. The God of Scripture who can do anything is absolutely able to create out of nothing, just as He said He did: "By faith we understand that the worlds were framed by the word of God, so that the things which are seen were not made of things which are visible." And most importantly, God does not change. In this instance, Pope Francis, like so many other religious leaders, is putting man's word above God's Word. And not only that, he's also going so far as to say that only a magician with "a magic wand" could create the way that God said He created in Genesis! Frankly, this shows a lack of understanding of who Scripture claims God is—the all-powerful Creator who is capable of doing what is impossible to man. Sadly, this view of God is rapidly spreading even throughout the Protestant church. God and His Word are not open to arbitrary change simply because society changes as it is influenced by false religions. Ham reveals, yet again, his failure to comprehend that science and faith are compatible. To him, any science that seems to be in contrast with a literalist doctrine can only serve the purpose of undermining faith. "If God and His Word are open to change," he says, "then God's Word is not an authority on anything—man becomes the authority because he gets to decide when and how God's Word applies."